Voglibose is an alpha-glucosidase inhibitor used for lowering post-prandial blood glucose levels in people with diabetes mellitus. Voglibose delays the absorption of glucose thereby reducing the risk of macrovascular complications. Voglibose was first launched in 1994, under the trade name BASEN, to improve postprandial hyperglycemia in diabetes mellitus. Postprandial hyperglycemia (PPHG) is primarily due to first phase insulin secretion. Alpha glucosidase inhibitors delay glucose absorption at the intestine level and thereby prevent sudden surge of glucose after a meal. There are three drugs which belong to this class, acarbose, miglitol and voglibose, of which voglibose is the newest. Voglibose has fewer side effects than both acarbose and miglitol. 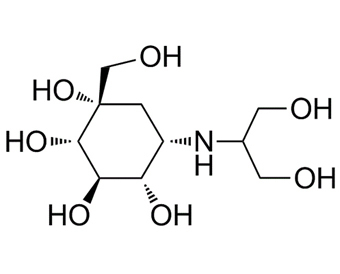 But acarbose has an edge over voglibose in terms of efficacy (FPG, PPHG, HBA1c).
. Chen, X., Y. Zheng, and Y. Shen, Voglibose (Basen, AO-128), one of the most important alpha-glucosidase inhibitors. Curr Med Chem, 2006. 13(1): p. 109-16.
. Ikenoue, T., et al., Effect of a new hypoglycemic agent, A-4166 [(-)-N-(trans-4-isopropylcyclohexanecarbonyl)-D-phenylalanine], on postprandial blood glucose excursion: comparison with voglibose and glibenclamide. Biol Pharm Bull, 1997. 20(4): p. 354-9.